This book includes a foreword by Jane Dacre, Academic Vice President, Royal College of Physicians, Professor of Medical Education, CHIME, Royal Free and University College Medical School, University College London, Consultant Physician and Rheumatologist, The Whittington Hospital, London. This book prepares you for the often daunting life after medical school, detailing everything you need to know about preparing, applying and surviving. It's the most up-to-date guide available filling you in on recent important changes to the application system. This practical guide is full of valuable tips, tables, worked examples, frequently asked questions, further resources and useful addresses. 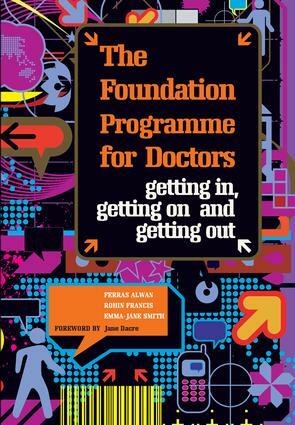 Highly recommended for final year medical students and other clinical medical students preparing for their final year, this book is also invaluable for junior doctors progressing through the Foundation Programme and all those with teaching and supervisory responsibilities in medical schools and hospitals. 'An invaluable resource for our new generation of doctors. It takes readers through the process from application, to F2 and beyond. It offers useful advice in a useable and readable format. It is written by a group of current and past medical students who have lived through, and continue to live through, the insecurities of the changing medical career structures. Its style is informal, engaging and easy to absorb, so it should be a good distraction for those currently in the run-up to their finals exams. Good luck to all of you, and don't forget, Medicine is a wonderful career.' - Jane Dacre, in the Foreword.